I must confess, I thought in a battle of White vs Brown that the former would win easily. White did in fact win the round, but it was hard fought round. It was almost split down the middle. Luckily, there was no tie to settle. But those of you who feel bad about brown's loss, just remember, um... I forget. Oh, I know, picture a cat hanging from a branch by one paw. Feel inspired now? Yeah I never understood how killing a cat was supposed to make you feel better either. With that in mind, let's meet our next contestants. 5 Fun Facts With Black! 1) Is scared of itself and refuses to sleep without the lights on. 2) High school girlfriend was Chartreuse but they split after a trip to the movies (she didn't care for The Color Purple). 3) Spends weekends clog dancing. 5) Has a doctorate in funk. 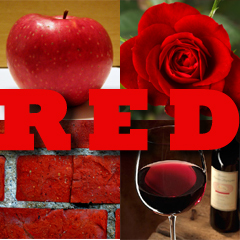 5 Fun Facts With Red! 1) Grew up in Russia but doesn't like to talk about it cause of the association. 2) Mother of three children which she can't see because she's color blind. 3) Had a crush on Turquoise in college, but married his best friend Ted. 4) Doesn't like The Godfather part I or II but loves III. 5) Likes to sit on park benches and people watch. As they say in France, who are you going to vote for (though likely they say it in French)? Rep returns Tuesday with the next battle so make sure to get your vote in before then. Ooh. Tough one. There is much to be said about both. Black makes anything cool, and goes with everything. But red is hot and fiery and makes cars go faster. And red is my favourite colour, so that's what I pick. But it's a close call. Gotta go with a fellow Russian – RED. Black. To go with the white and the green. Black - it negates all other colors. Red will always prevail for me. OK this one is tough, I like black shirts and hats but love red vehicles, red is hot but black is too hot when you are sitting in the sun, if you are looking at a car that is black it is dirty pretty quick after you wash it, where red is still dirty but looks good, so if you have to choose dirty and want to look good then red is better than dirty and ugly---so with that said I'll go with Red. I'm going with black, because otherwise, Tracy Morgan might find me and yell at me. 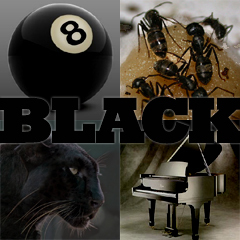 Great fun facts, especially Black's split with Charteuse over The Color Purple. Totally understandable. Black is depressing, and red is the color of love. There's no competition here: BLACK!! Red all the way, it's the new beige. I live in the PC capital of the world....where if you like Red better than Black, you're a racist. So I won't say what I like better. Literally. Like, I just counted. BLACK > ALL. Well, black is a lot closer to my favorite color (gray), and black is the dominant color on The Non-Review, and red makes my eyelashes itch and I hate that, so I vote black. Duh. It's gotta be BLACK. Who's ever heard of "a little red dress". Besides...red is evil. Aunt Flo is red. MY crimefighting outfit is a combination of red and black so I will go with red since red is the only color, black is not a color but a combination of all colors. So red it is for me.